Trump’s child separation policy is a moral and constitutional abomination. 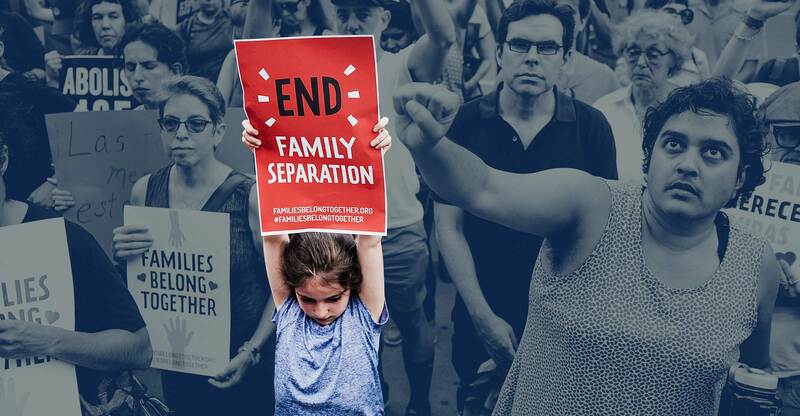 Immigrant rights advocates and others participate Friday in a rally at the Federal Building in Lower Manhattan against the Trump administration's policy that enables federal agents to take migrant children away from their parents at the border. Photo illustration by Slate. Photo by Spencer Platt/Getty Images. The government has offered no substantive legal justification for the Trump administration’s policy of indefinitely separating children from their parents at the border. On Thursday, Sen. Dianne Feinstein proposed a law that would bar the intentional separation of asylum-seeking parents from their children when they cross the border. “It’s hard to conceive of a policy more horrific than intentionally separating children from their parents as a form of punishment,” the California Democrat said in a statement publicizing the move. Affidavits from a February lawsuit filed by the American Civil Liberties Union show precisely what Feinstein describes. The Congolese asylum-seeker at the center of the case, known as “Ms. L,” described having her 6-year-old daughter taken away by the U.S. government without explanation. “She was taken into another room and then I heard her screaming: Don’t take me away from my mommy!” the woman wrote. In court filings, the government questioned whether Ms. L was in fact her child’s mother. The woman had her child returned only after the suit was filed and the government was made to conduct a DNA test that proved her parentage. “[T]hese terrible policies call into question whether we are in violation of our own laws and our obligations under international law,” Feinstein said in proposing a law to stop the practice of splitting up families at the border. Feinstein is right: There seems to be no coherent legal justification for separating children from their parents, some of whom—like Ms. L—presented themselves at a port of entry as asylum-seekers and have not been charged with any crimes. The rationale top Trump administration officials have stated publicly—that such a practice will deter undocumented immigrants from seeking asylum at the border—appears to be so patently unconstitutional that the government’s own lawyers have renounced it in court. If the broad outlines here sound familiar, that’s because the legal fight over the policy is shaping up as a replay of the battle over President Donald Trump’s disastrous first travel ban, which was quickly struck down as a blatant violation of due process rights. A federal judge in San Diego is set to rule any day on the question of whether the government is lawlessly abducting immigrant children at the border. The ACLU is seeking a classwide preliminary injunction to put a stop to the practice. Based on a close reading of legal filings in the case, the public statements of policymakers, and a transcript from a critical hearing last month, it’s difficult to fathom how the judiciary could possibly rule in favor of the government. In court proceedings last month, Judge Dana Sabraw indicated that the case, Ms. L v. ICE—filed by the ACLU on behalf of Ms. L and other asylum-seeking parents who have had their children taken away—should hinge on the due process clause of the Fifth Amendment. Under a series of Supreme Court precedents, family integrity has long been considered a “fundamental” due process right. Among other rulings, the ACLU’s lawsuit cited the Supreme Court’s opinion in 2000’s Troxel v. Granville, which stated that there is “a fundamental liberty interest of natural parents in the care, custody, and management of their child.” This precedent mandates both that the government show a compelling government interest in separating a child and parent—preventing child abuse, for instance—and that it is using the least restrictive means to fulfill that interest. Per the New York Times, that policy was put on hold at the time because it was deemed too controversial. But in the last several months, as Trump has reportedly put intense pressure on his Cabinet to reverse an uptick in border crossings by undocumented immigrants, such a policy appears to have been put into place. Last month, the Washington Post reported that a pilot version of a program of separating families had occurred “in the Border Patrol’s El Paso sector, which includes New Mexico, between July and November 2017, and [the administration] said the number of families attempting to cross illegally plunged by 64 percent.” And in a pair of speeches last month, Attorney General Jeff Sessions seemed to herald the launch of a formal policy, calling it a “zero-tolerance” immigration measure. “If you don’t want your child separated, then don’t bring them across the border illegally,” Sessions said. “It’s not our fault that somebody does that.” Kelly, now Trump’s chief of staff, stated again last month in an interview with NPR that the purpose of “family separation” is deterrence. “The name of the game to a large degree … a big name of the game is deterrence,” he said. “Such a policy would mean separating parents and children, because the parents would be placed in criminal detention, where children cannot be held,” the Post noted. In a statement provided to the Post, Homeland Security spokeswoman Katie Waldman said, “DHS does not have a policy of separating families at the border for deterrence purposes.” Waldman did justify the splitting of families, though, by claiming it was necessary to combat child smuggling as well as to “protect” children from their own “nefarious” border-crossing parents. “DHS does … have a legal obligation to protect the best interests of the child whether that be from human smugglings, drug traffickers, or nefarious actors who knowingly break our immigration laws and put minor children at risk,” she said. Let’s imagine that, based on all this evidence, Judge Sabraw—who was appointed by George W. Bush—determines there is in fact a new government policy of separating children and parents at the border. The court would then need to examine the government’s stated rationale for enacting such a rule. For the policy to pass constitutional muster, the government needs some legal justification for the indefinite separation of parents from children, even when the parents and children are undocumented immigrants. The Supreme Court held in 2000’s Zadvydas v. Davis that due process rights apply to undocumented immigrants. This holding suggests the government may not separate asylum-seekers from their children indefinitely and without cause. During last month’s arguments, it sounded like the judge believed the policy justification stated by Kelly—deterrence of illegal immigration—was clearly unconstitutional. “A policy of deterring families from entering the United States by separating them … would [that not be] a clear substantive due process violation?” Judge Sabraw asked of Fabian, the government attorney. “If it was done without any otherwise authority to cause the separation, I think, we might be closer to that problem,” she acknowledged, claiming the government does have such authority stemming from the Immigration and Nationality Act. When Sabraw responded that the government still hadn’t presented a substantive due process rationale, Fabian said the government has a right to separate parents who are jailed for violating the law from their children while those parents are behind bars. The ACLU, in this lawsuit, is not contesting that fact. What it is contesting is the government’s apparent policy of refusing to return children to parents once they’ve served their time—generally around a month for misdemeanor illegal entry—and of taking children from parents who present themselves at a U.S. port of entry seeking asylum and have not been charged with any crime. When confronted about the legality of these practices, the government has merely asserted they are legal without providing a substantive justification. “They can’t come up with a justification because the truth is that the only justification that makes sense is their perceived view of the deterrence value,” Lee Gelernt, the ACLU attorney litigating the case, told me. Fabian, at this point, simply stated: “We don’t agree that that has to be made.” She then said that when a minor and parent are separated, the Trafficking Victims Protection Reauthorization Act dictates that the minor be placed with another custodian. But she didn’t explain why the decision to indefinitely separate the minor from the parent would be made in the first place. The notion that a child is better off without his parent not only flies in the face of logic, it also contradicts government policies. The notion that a child is better off without his parent not only flies in the face of logic, it also contradicts government policies that allow the detention of some undocumented asylum-seekers with their children. If such parents have historically been considered suitable custodians—and in some cases are still considered suitable custodians—how can other similarly situated parents not be considered suitable custodians? The ACLU has asked the court to allow it to add more plaintiffs to Ms. L v. ICE, which was previously filed with two plaintiffs. One of the motions seeking class certification includes affidavits from several other immigrants who’ve had their children taken away at the border. Those affidavits offer more examples of what it looks like when kids as young as 18 months old are literally ripped away from their parents. All I can remember is how much my son and I were both crying as they took him away. I do not recall anyone questioning whether I am really his biological father or whether I was a danger to him or abusive in any way. I even had my son’s birth certificate proving I am his father. … It has been six months since I last saw my son. Shortly after arriving, I was told that I was going to be separated from my daughter. There were no doubts expressed that I was my daughter’s biological mother and I have a birth certificate to show our relationship. They did not say that I was a danger to my daughter or was abusive. … I know that [my children] are having a very hard time detained all by themselves without me. They are only six and four years old in a strange country and they need their parent. I hope I can be with my children very soon. I miss them and am scared for them. Testimony of Ms. J. I. L.
That day, March 13, a woman came to pick up my kids. I was given only five minutes to say goodbye before J.S.P.L. and D.A.P.L. were torn from me. My babies started crying when they found out we were going to be separated. It breaks my heart to remember my youngest wail, “Why do I have to leave? Mami, I want to stay with you!” … In tears myself, I asked my boys to be brave, and I promised we would be together again soon. I begged the woman who took my children to keep them together so they could at least have each other. She promised she would, and she left with my boys. … I am particularly worried about my older son J.S.P.L. who was not doing well back in El Salvador after he saw MS gang members beat me and threaten me. He did not even want to leave my side to go to the restroom. … Both of my sons need their mother. I do not know if they are eating, sleeping, or even going to the restroom. The U.S. immigration officers then told me that they were taking my [18-month old] son from me. They said he would be going to one place and I would be going to another. I asked why the officers were separating my son from me. They did not provide any reason. … The immigration officers made me walk out with my son to a government vehicle and place my son in a car seat in the vehicle. My son was crying as I put him in the seat. I did not even have a chance to comfort my son, because the officers slammed the door shut as soon as he was in his seat. I was crying too. I cry even now when I think about that moment when the border officers took my son away. Nielsen has said the government is acting as expeditiously as possible in such cases. “It’s not our intent to separate people one day longer than is necessary to prove that there is in fact a custodial relationship,” she told NPR last month. These affidavits call that claim into question. Gelernt added that he has never seen anything this dramatic in his many years of working on immigration cases and doesn’t believe the public outrage has been nearly commensurate with the actions taking place.